Description: MEC 350 leads train PL-1 northbound past the entrance to the Holyoke Canoe Club, a couple miles south of the Mt. Tom Power Plant. 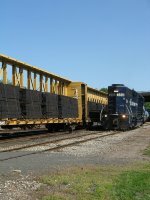 The fifteen car train is making its way from Plainville, CT. to the East Deerfield, MA. Yard. Description: MEC 350 leads train PL-1 northbound past the Mt. Tom Power Plant. 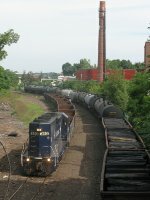 The fifteen car train is on its way to the East Deerfield Yard from Plainville, CT. Description: MEC 350 leads train PL-1 northbound past Highway Auto Salvage near CPR 16 on the Connecticut River Line. The train is making its way from Plainville, CT. to the East Deerfield, MA. Yard. Description: Train PL-1, with MEC 350 doing the honors, arrives in Berlin to pick up the second half of yesterday's train from East Deerfield, MA. Description: Train PL-1, with MEC 350 doing the honors this week, departs Berlin after picking up the second half of yesterday's train from East Deerfield, MA. 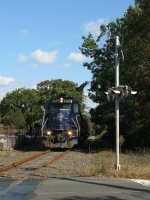 Pan Am's track through Plainville and into Waterbury diverges from Amtrak's Springfield Line just north of milepost 26. 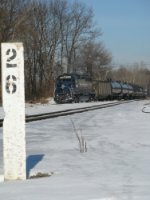 Description: With the GE facility in the background, MEC 350 brings the last three LPG tank cars into the Plainville Yard after picking them up in Berlin from yesterday's run out of East Deerfield, MA. Description: MEC 350 puts together train PL-1 on a sunny June morning. The train will soon begin its northbound trek to East Deerfield, MA. Note the centerbeam cars on the main-they're loaded with ties from Perma Treat, which usually loads gondolas in New Britain. Due to a shortage of gondolas, a few centerbeam cars have recently been loaded in the Plainville Yard. Description: MEC 350 leads a seventeen car PL-1 northbound across the Farmington River as a family patiently awaits the day's catch. Description: Pan Am hides behind a cloud of smoke as it throttles up. Description: MEC 350 switches Perma Treat on train PL-1. 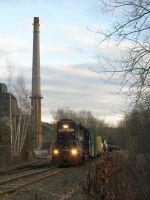 Description: MEC 350 rounds the curve in Berlin with train PL-1. The train will soon enter Amtrak's Springfield Line, seen in the middle. Connecticut Southern's spur to AltuGlas International is seen in the foreground. Description: ED-2's crew brings their power, cosisting of MEC 503 and MEC 350, to the house track after shuffling a few cars in the yard. Description: Pan Am train POED heading west on the Lowell Branch after leaving the Haverhill Line. Description: MEC 350 sorts cars in the Plainville Yard with train PL-1. The crew is preparing to depart north for East Deerfield, MA. 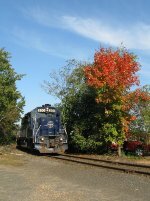 Description: MEC 350 sorts cars under some colorful foliage in the Plainville Yard with train PL-1. The crew is preparing to depart north for East Deerfield, MA. Description: MEC 350 shoves train PL-1 back to the Plainville Yard after servicing the AmeriGas facility at the end of the Canal Line. Customer Forestville Lumber is at left. Description: PLED (PL-1) heads North through Hayden Station road. This engine had one of the best horns I've ever heard. Description: PL-1 idles at Hubbard Hall in Waterbury. The conductor closes the gate after a days work at HH. Description: PLED crosses the CSX Boston Line entering its own Conn River Line northbound for E. Deerfield Yard. Description: PLED comes north into Holyoke. Train will stop briefly to flag the crossing here at Riverside St. Description: PLED stops short of Riverside St in Holyoke to flag this crossing. Description: PLED heads north into Holyoke yard limits. The Pioneer Valley ties in here with the track on the left next to the ties. Description: PLED eases across the river in Holyoke approaching Gatehouse Rd. Description: RUPO 377e-350e crosses from Lewiston into Auburn. Description: After finishing their trip - the power from the RUPO that I chased earlier is seen resting at Rigby. They went east again on POWA after 20:00. Description: ED-2 with 378 & 333 idle near the sand tower after returning from Lesco. ED-4 with 350 & 51 idle. 351 will soon leave 350 here and take its train north to Agway in Bernardston. 351 could use a repaint and fresh numberboards. Description: ED-2 with 378 & 333 idle near the sand tower after returning from Lesco. ED-4 with 350 & 51 idle. 351 will soon leave 350 here and take its train north to Agway in Bernardston. Description: EDPL with 352 throttles up and departs E. Deerfield for Plainville, Conn. ED-4 with 350 & 51 idle. 351 will soon leave 350 here and take its train north to Agway in Bernardston. Description: Empty Grain Extra lead by UP 6730 Ex.CNW 8828 in Crescent.